ATID is an independent, privately funded institution which aims to foster new and significant thought on the crucial issues facing Jewish education. ATID is a tax-deductible charity in the United States through the American Committee for the Advancement of Torah Education in Israel, Inc. Tax identification # 11-2434546. ATID is a registered "Amutah" in the State of Israel, # 58-035-142-7. 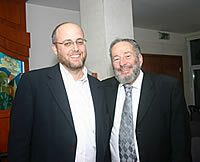 ATID is the founding body of Rabbi Chaim Brovender's WebYeshiva.org — the first fully interactive Internet-based Yeshiva.